Dashboard widget displays Google Analytics data. Is there a better alternative to AnalyticsWidget? Is AnalyticsWidget really the best app in Compilers category? Will AnalyticsWidget work good on macOS 10.13.4? 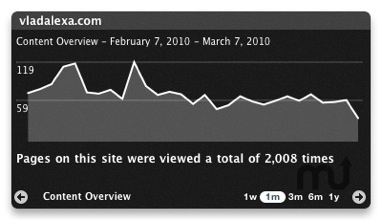 AnalyticsWidget displays Google Analytics data. There are 3 types of reports : Content Overview, Visitors Overview and Traffic Sources Overview , each of these also has 3 views: a graphical main view, a table of small graphs, and a textual view. On the back side you need to enter the details for the google analytics account, press get sites then select one of your sites. AnalyticsWidget needs a review. Be the first to review this app and get the discussion started! AnalyticsWidget needs a rating. Be the first to rate this app and get the discussion started!